The enamel pin craze continues and no sign of slowing down. Our pals at The Artpin Collection have announced their latest set of pins that drops in a few hours time at DesignerCon 2017! The new series features Andrea Kang, MCA and last but not least Nathan Jurevicius. Hold on there’s a GIVEAWAY too! See below for details. (OG gold – edition of 66, Rotofugi blue exclusive – edition of 50) will drop at the convention. At 1.5” tall, these pin are neither too big nor too small – they are just the right size :). MCA – a rare sighting of Fleabaines, man of the mountains. Limited edition of 100. These are 1.5” wide. Arianrhod by Nathan Jurevicius is making a re-appearance in two new colorways, limited to 50 pieces of each colorway. 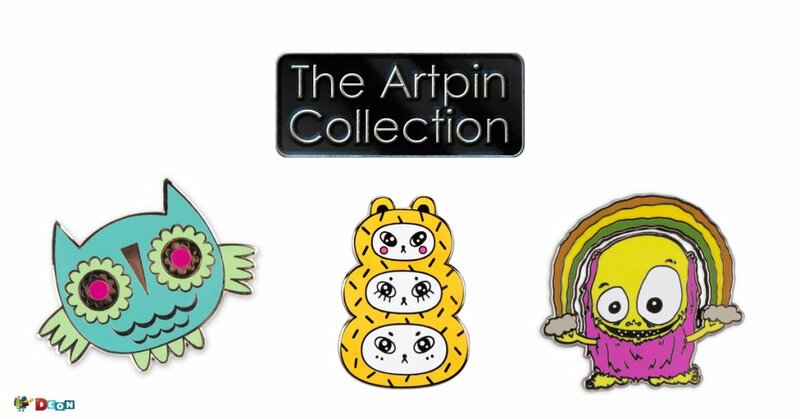 If that’s not enough, three booths will have their own exclusive colorways of The Artpin Collection pins: Horrible Adorables (The Wolf – Zombie version, #809), Candie Bolton (Hakutaku and Baku – GID versions, #1225), and Instinctoy (Liquid – GID version, # 503). The Artpin Collection has announced a giveaway pack lottery. Winners will receive an assortment of long sold out and rare colour pin variants! To enter, all you need to do buy one exclusive variant from and artist *and* a matching colorway from the Rotofugi and SquibblesInk booth (#902), take a photo with the pins and post it to IG with tags #seeingdouble and @artpin_collection. Winners will be announced and contacted as soon as the convention is over. Talking of Pins, The Toy Chronicle actually have three of our pins available to purchase right now. We have our TTC DTA Win Pin. Available for £10 on our TTC Big Cartel Store HERE. We also have our Secret TTC Gang Pins available too! If you know about #cough, you know! Available in two colourways – TTC Blue & TTC Yellow can be purchased from our Secret TTC Gang store HERE for £8 each (or buy the set of two for £14). Our #cough pins are ready for shipping and will be going out this week to all those who pre-ordered them early. Purchasing a pin from TTC really helps to support us. It helps us to fund projects such as our new TTC Mobile App that you can now download for FREE on the App Store and Google Play for your smartphones! Smart! Jump on that!